This strategy document for Lincolnshire on Neglect, details the considerable extent to which ‘neglect’ features as part of, or only category of concern for children. The chapter seeks to identify / define what neglect is, the serious impact it can have upon children and, whilst recognising the difficulties in identifying it, supports an Early Help approach to families. Each family should have a ‘Keep it Going’ Plan, designed to maintain standards of care, and each agency should audit their work in this area of family concern. In March 2019, information was added regarding schools’ responsibility to safeguard children in accordance with the latest DfE guidance Working Together to Safeguard Children and Keeping Children Safe in Education (see Section 1, Purpose, Official Definitions of Neglect and Section 4, The Role of Early Help in Addressing Neglect). The Scope Box now also contains Relevant Guidance for further, more in-depth references. The purpose of this document is to set out the strategic objectives and targets of Lincolnshire's approach to tackling Neglect. This strategy also identifies key risk factors and vulnerabilities of adults with parental responsibilities and children that can have an impact on neglect. It in addition identifies key priority areas of work in order to improve Lincolnshire's response to Neglect. Key to the strategy is the importance of identifying Neglect and supporting children and families through Early Help Arrangements. This strategy has been developed in conjunction with Lincolnshire Safeguarding Children's Board LSCB partners. Due to the nature of Neglect, and the possibility that parents or carers may not wish to work with various agencies, staff should be particularly aware of the escalation policy within their own agency and this strategy should therefore be considered alongside individual agency and related LSCB strategies, policies and procedures. There are additional duties for schools to safeguard and promote the welfare of children and young people (Keeping children safe in education: Statutory guidance for schools and colleges). In essence these require all school staff to have knowledge of the signs and symptoms of abuse and an understanding of the local early help and child protection arrangements. Schools also have additional responsibilities in cases of suspected FGM, Peer on Peer abuse and children at risk of sexual exploitation. However, it is important that professionals are aware the Data Protection Act 2018 and the GDPR place duties on organisations and individuals to process personal information fairly and lawfully and to keep the information they hold safe and secure. The Data Protection Act 2018 contains ‘safeguarding of children and individuals at risk’ as a processing condition that allows practitioners to share information. This includes allowing practitioners to share information without consent, if it is not possible to gain consent, it cannot be reasonably expected that a practitioner gains consent, or if to gain consent would place a child at risk. Note: The Data Protection Act 2018 and GDPR do not prevent, or limit, the sharing of information for the purposes of keeping children safe. Fears about sharing information must not be allowed to stand in the way of the need to promote the welfare and protect the safety of children. See Protocol on Sharing Information in Order to Safeguard and Promote the Welfare of Children. LSCB's vision is to reduce the incidence of Neglect of children in the County and further to reduce repeat incidents of Neglect for individual children. We want to get it 'right first time' and then help families to keep the improvements going. The way forward is that everyone has an agreed understanding of what Neglect is, how it affects the development of children and young people and that together we establish an agreed and effective approach to reducing levels of Neglect in childhood. Within universal services all agencies work with families to improve and maintain standards of care. Where staff are concerned with a lack of progress or engagement at the universal level, such concerns should be discussed within their own agency and consideration given to initiating a Team Around the Child (TAC) (Team Around the Child Supporting Documentation). Consultation with an Early Help Advisor is available via the Children’s Services Customer Services Centre, (Tel: 01522 782111). Where early identification of difficulties arises, and supporting the family through sustainable improvements in the care of children through Early Help arrangements is indicated, the development of a TAC is needed. There is a need to promote a culture amongst all agencies of robust planning to promote sustainable improved life chances for children. To deal effectively with identified Neglect of children, the work with the family must clearly set out what needs to happen, by when, and who is responsible for specific parts of the plan. Plans should set out clearly what will happen if improvements do not happen and/or are not maintained. In all our work with children, we want to reduce the number of assessments experienced by children and their families and so work with the family has to involve listening to the child and, whenever possible, making sure the child's wishes are followed within the plan. We want to provide parents with the tools and techniques which help them to make changes for the better, and to maintain the improvements. Key to the vision is the importance of encouraging and supporting positive parenting and enabling those caring for children to make sufficient and sustainable changes. Neglect is the most common reason for a child to be the subject of a Child Protection Plan in the UK. It happens when parents or carers can’t or won’t meet a child’s needs. Sometimes this is because they don’t have the skills or support needed, and sometimes it’s due to other problems such as mental health issues, drug and alcohol problems or poverty. It may involve a child who is not being protected from sexual harm, Child Sexual Exploitation or the impact of Domestic Violence and Abuse. Neglect may occur during pregnancy as a result, for example, of maternal substance abuse. In Lincolnshire there is a Pre-Birth protocol which must be followed. This is one approach which aims to improve pre natal care to help with early identification of potential neglect and to help families understand the importance of preparing healthily and carefully for the new baby. "Neglect is the most cited reason for children to be referred to Children's Social Care and for becoming Looked After, as reported to central government. Other categories of concern may be masked by the use of the code denoting multiple reasons, which might include Neglect, Physical, Sexual or Emotional Abuse and "Neglect remains the largest category or reason for referral and entering care". (October 2014 the Association of Directors of Children's Services LTD (ADCS). The ADCS report also noted that 35% of authorities believe that early intervention has started to affect safeguarding activity…There was an overwhelming view that early intervention does play a crucial part in affecting safeguarding activity. "I think that parents do not always have help, and could have had a difficult time themselves" (Neglect Matters quote from young person). For the purposes of this strategy, Neglect is considered where it is the primary focus of concern. It is acknowledged that the concept of Neglect is known to be an element of other areas of abuse. The position of the whole family needs to be considered and understood as the welfare of children is best served through supporting those looking after them, but the focus must always be on improving the outcome for the child. It also has to be established if the neglect of the child is a transient episode or is entrenched behaviour by the adults. In some families the approach taken by carers is one of "high criticism/low warmth" and whilst this is neglectful of children's emotional needs, it is an aspect which can be amended through work with families at as early a stage as possible. With Early Help arrangements, describing this aspect can lead to early and sustainable approaches to parenting, and converting this to positive parenting. A child's needs also change over time, and every child is different. Each child will have different responses and personal resilience to their situation based upon the child's age, ability, disability, behavioural difficulties, experience, understanding, mental health and additional support. Staff working with families should also be conscious of the need to recognise that children's growth and development can differ significantly and care should be taken to ensure a clear understanding of when developmental traits are outside the expected levels for children generally and are potentially more attributable to Neglect. In addition Working Together to Safeguard Children has introduced the concept of Contextual Safeguarding which recognises that as well as threats to the welfare of children from within their families, children may be vulnerable to abuse or exploitation from outside their families. These extra-familial threats might arise at school and other educational establishments, from within peer groups, or more widely from within the wider community and/or online. These threats can take a variety of different forms and children can be vulnerable to multiple threats, including: exploitation by criminal gangs and organised crime groups such as county lines; trafficking, online abuse; sexual exploitation and the influences of extremism leading to radicalisation. The impact of Neglect on children is often accumulative, advancing gradually and imperceptibly and therefore there is a risk that agencies do not intervene early enough to prevent harm. It is important that all agencies identify emerging problems and potential unmet needs seek to address them as early as possible. It is equally important that practitioners are alert to the danger of drift and 'start again' syndrome. The agencies in Lincolnshire have agreements in place such as the Threshold document and the Local Protocol for Assessment, which provide effective ways to identify emerging problems and potential unmet needs for individual children and families as well as clear guidance and procedures for all professionals, including those in universal services and those providing services to adults with children. The provision of early help services should form part of a continuum of support to respond to the different levels of need of individual children and families. In order to address Neglect in Lincolnshire it is important that agencies effectively use the Early Help framework to assess and plan services for children and families. Likewise it is important that any intervention with families is co-ordinated appropriately to enable parents to sustain the changes in care given to children. Neglect is dangerous and can cause serious, long-term damage - even death: Davis and Ward (2012) found that the risk of fatalities from neglect may be as high as that from physical abuse and the risks of further abuse are higher with neglect than other types of abuse. Neglectful parenting is most damaging in both the early stages of life and in the teenage years. A longitudinal study commissioned by the NSPCC found a strong correlation between the neglect and maltreatment of adolescents and poorer emotional wellbeing, including self harm and suicidal thoughts (NSPCC 2012). Children who receive care which is unpredictable, rejecting or insensitive are more likely to develop attachments which are less secure. There is also a related impact on children’s social development: the evidence suggests that neglected children are more withdrawn and socially isolated and less socially competent than their peers. Neglect can be far-reaching in its consequences for a child. Not only will the experience of it make a child’s life miserable but it can affect all aspects of their development. It is also likely to influence the relationships they make with others in both early and later life and have an impact on how they parent their own children. (Howarth, 2007). 1 in 10 children in the UK have experienced neglect (Branson et al, 2012). 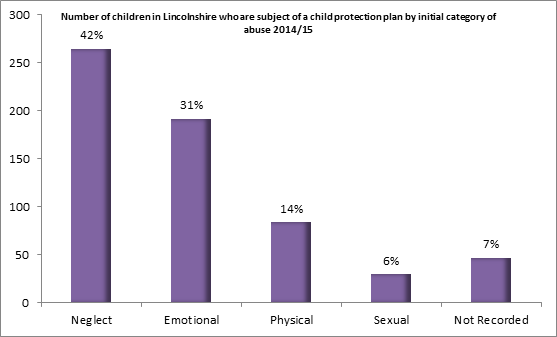 In Lincolnshire neglect is the primary reason for concern in 41.6% of cases (compared to 42.2% nationally) where children were subject to plans at initial child protection conferences. Over 21,300 children in the UK were identified as needing protection from neglect last year. Nationally neglect is a factor in 60% of serious case reviews. In Lincolnshire in the year 2013/14 there were 5162 referrals to children's services which cited neglect as a factor, and 959 re-referrals cited neglect as a factor. 275 children becoming subject of an Initial Child Protection Conference had Neglect cited as a plan category reason during 2013/14, whilst for 40 children subject to a second or subsequent Child Protection Plan, Neglect was cited as a plan category reason. Promote a common awareness and understanding of what neglect means in Lincolnshire and the effects upon children. Ensure continued multi-agency training in early identification and help for families. Minimise the incidences of neglect for children and the repeat incidences of neglect for children. Increase ongoing support through consistent 'step down' to TAC after Child in Need or Child Protection Plan end. To support practitioners to resolve common problems when working with families experiencing neglect. We recognise that agencies also have their own approach to working out if children are being Neglected. For example, we note the use of the Graded Care Profile by Lincolnshire Community Health Services, and we encourage all agencies to use their own resources to both recognise and tackle Neglect at universal, targeted and specialist levels. For example, Lincolnshire Fire and Rescue service have a method of looking at the safety of homes by judging the amount of clutter/hoarding which is seen in homes; the service understand the connection between this and a neglectful approach to the care of children. See Fire and Rescue Resource. Click here to view Plan (Neglect Strategy) table.